The Ann Arbor Film Festival is the longest-running independent and experimental film festival in North America, established in 1963. Internationally recognized as a premiere forum for independent filmmakers and artists, each year's festival engages audiences with remarkable cinematic experiences. The six-day festival presents approximately 40 programs with more than 180 films from over 20 countries of all lengths and genres, including experimental, animation, documentary, narrative, hybrid, and performance based works (49th AAFF program line-up). The Ann Arbor Film Festival is steeped in a rich tradition of ground-breaking cinema. 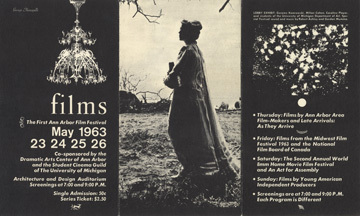 Thousands of influential filmmakers have showcased early work at the AAFF, including luminaries such as Kenneth Anger, Agnes Varda, Andy Warhol, Yoko Ono, Gus Van Sant, Barbara Hammer, Lawrence Kasdan, Les Blank, Chick Strand, and George Lucas. The Ann Arbor Film Festival receives more than 2,500 submissions annually from more than 65 countries, serves as an Academy Award®-qualifying festival and provides more than $20,000 in cash and film stock/services to filmmakers through its awards competition. The AAFF also pioneered the traveling film festival concept in 1964 and currently visits more than 35 cities throughout the world with award-winning and favorite short films from each year's festival. In this online archive of the Festival's history, you can browse past programs and photographs; flyers and posters; or listen to interviews from previous seasons and read historical newspaper articles from the Ann Arbor News and Ann Arbor Sun. You can also check out several films that have screened at the AAFF. The Ann Arbor Film Festival Archive is presented in partnership with the Ann Arbor Film Festival.